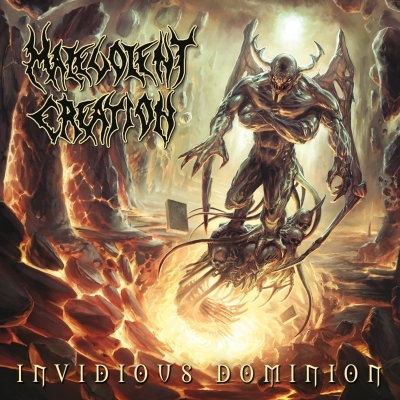 MALEVOLENT CREATION - INVIDIOUS DOMINION LTD. EDIT. (DIGI) | Online Shop | Wizard LTD. Album: "INVIDIOUS DOMINION LTD. EDIT. (DIGI)"
Malevolent Creation are back to blast and grind their back into the extreme metal game. They’ve influenced countless younger bands since their inception in 1987 and they show no signs of slowing down on their eleventh studio album. These death metal veterans have honed their skills to brutal perfection. It’s no wonder why bands like Slipknot have cited this band as a major influence over the years. As mastermind Phil Fasciana sums it up, „If you‘re too slow, you‘ve got to go.“ The band are notorious as ever, never allowing the revolving door of musicians to affect the power and skill of the music they’re known for. Lineup changes aside, they are pumped and ready to go with warm-up headlining dates this July (with Gigan as support) straight into a direct supporting slot for the almighty Exodus this August/September! They’ll continue touring after that to properly support this album, something that had been missing after ‘07’s Doomsday X was released. Having Erik Rutan (Cannibal Corpse, Nile, Goatwhore, Through the Eyes of the Dead, etc.) at the helm, Invidious Dominion has an edge and a bite that most extreme metal bands would kill for.